Nite Owl Creates: Utah Spring Theme Pinterest Party! Utah Spring Theme Pinterest Party! Many thanks again to my friend Melissa for hosting this spring theme Pinterest party at her house. It was the perfect amount of room for everyone who was able to come. I'm so excited to share all about the food we had and crafts we made! Thanks to Shop Beautifully Said, I won their felt letter board at Snap Conference! I added to the original letters by buying some Heidi Swapp letters from Hobby Lobby. I wish I had more of these to eat. Brownie/cookie bites with chocolate chunks and caramel on top. Alice brought delicious hamburger bites! Soo simple and delicious! I could have sat and eaten a lot more if I wasn't so occupied with other food + crafting. 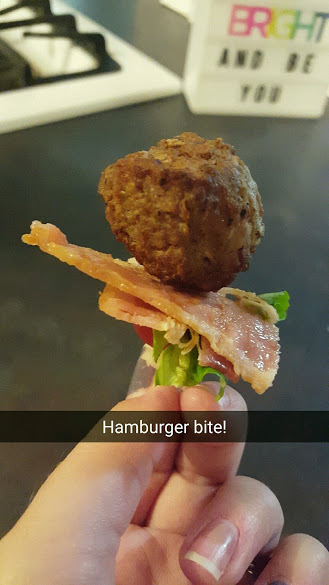 You can probably figure it out by looking at the picture but there is a meatball, bacon, lettuce and a 1/2 grape tomato all on a toothpick. I want to make these myself sometime. How cute are these drink holders! The pink one is a Sangria Punch. 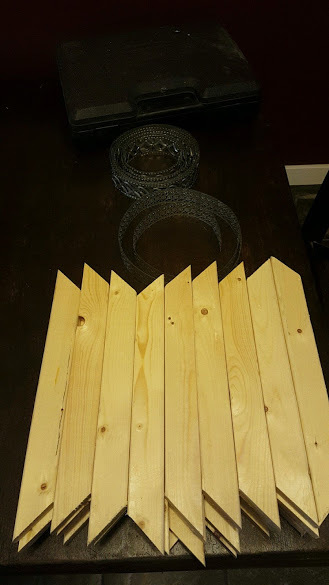 Supplies for the string art mason jars as well as the cuff bracelets. Thank you so much DMC for the supplies to make the bracelets! They were fun to start and while none of us finished, I think they will turn out looking pretty awesome! The mason jar string art was something I created with those wood floor laminate tiles from Home Depot, floss from Joanns and Michaels, artificial flowers from Joanns and my trusty glue gun. 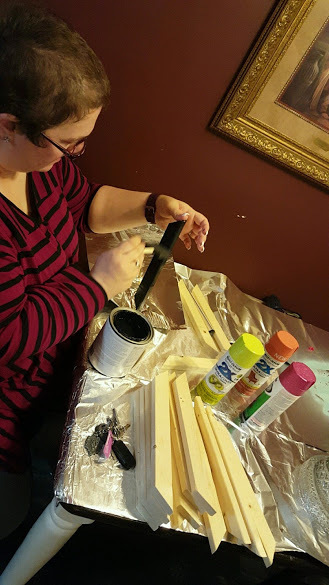 Melissa's craft was for us to make jewelry board earring holders. 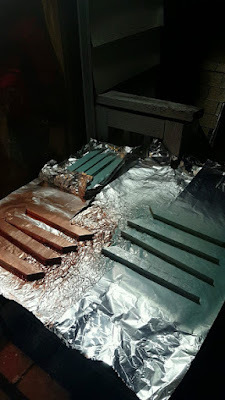 We started with spray painting our wood with colors, complimentary of Rustoleum! 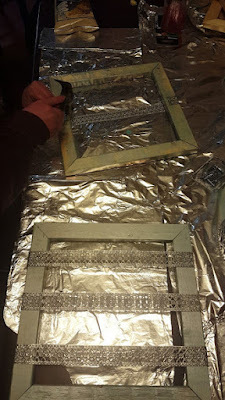 One of the crafters using chalkboard paint instead for her frame. Fun idea! Hammering the nails to hold this metal ribbon on. You can find it at Hobby Lobby or on Amazon. Honestly this is the first time I've ever sewn at a Pinterest party (just a few stitches) but these ribbon bookmarks were a craft Alice brought for everyone to do and I think they turned out pretty cute! Add a pop of color to your glassware! 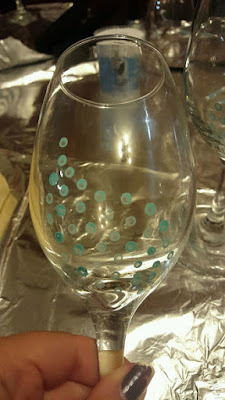 We used nailpolish, Q-Tips and tall stemmed glasses to create a fun pattern. I did a blue shade of nailpolish with silver on top. So that's that! Overall a very successful and productive night. Thank you again soo much Melissa for letting us do this at your place and for all those who were able to attend. It was so fun to see / meet / get to know you better. This looks fun! So, a Pinterest party is a party where you eat and craft things out of Pinterest? Everything in this Utah Spring Theme Pinterest Party was brilliant. I am drooling over all the party foods shown in the images. 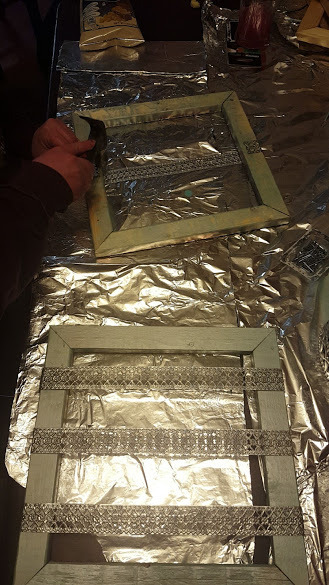 At some local party venues in Chicago I would also be attending a fun bash and have made some Pinterest inspired DIY gifts for that.